The conference will be taking place in the Bricker Academic Building (abbreviated as BA) located on the Waterloo Campus of Wilfrid Laurier University (see this map). The building is adjacent to the Science Research Centre. Information regarding accommodation in Waterloo can be found in the Visitor Guide, available online. However, group reservations have been made with the following hotels to offer discounts to the conference participants. Participants should make, as soon as possible, their reservations directly with the hotel (either by phone or by email - the contact information is given below) by quoting the "AMMCS-2013 conference" in order to receive the special discounted price. Holiday Inn Express: located in the heart of Southern Ontario and is steps to the St. Jacob's Farmer's Market, Antique Market, and Factory Outlet Mall. Our location is just over an hour west of Toronto and is only a short drive from the Region of Waterloo International Airport (YKF). We proudly offer complimentary Express Start Breakfast featuring two hot items daily omelets with cheese or scrambled eggs, sausage or bacon, and biscuits. 14 Benjamin Road. Book online or call: 1 877 660 8550. To make a guest room reservation at the University of Waterloo Conference Centre, you can complete the reservation form either online or in PDF format and fax it at (519) 746-7599 or e-mail it at accombook@uwaterloo.ca. Once this reservation form is submitted please note that a deposit will be processed on your credit card. Single Room will be charged $50.00 and Double Room will be charged $70.00. 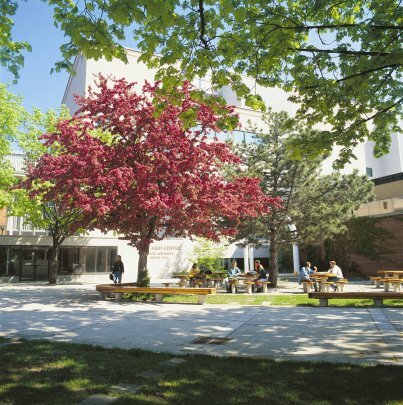 For students participants: Limited accommodation is available at Wilfrid Laurier University from August 25-30th for student participants attending AMMCS. Just steps from conference sessions, accommodation includes private bedrooms with semi-private washrooms. Each air-conditioned bedroom includes a single bed, desk and closet unit. Common lounges are located on each floor. Guests may select the individual to share the semi-private washroom with or they will be placed beside an individual of the same gender. The rate is $45.00/night, plus 13% HST. For more information or to register for accommodation please contact conferences@wlu.ca or call 519-884-0710 x3958 or x2771. Further details on Travel and Local Information can be found here. Accessibility Statement: AMMCS-2013 is committed to creating an accessible environment for all.